Over the past few days I have received quite a few emails asking me a great deal about Hanukkah and its significance. Though I have written about this before here @ Help! 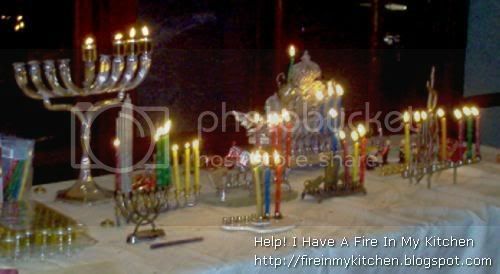 I Have A Fire In My Kitchen in the post "A Bit About Hanukkah & Some History", I realized that many Jewish traditions in regard to food I obviously take for granted. So in this post I will try to explain a bit more about Hanukkah than I did previously in the above mentioned post, and how the traditions of eating certain food groups developed. I will try and concentrate on three main points. Some of what is written below obviously has nothing to do with food per-say so if you are not interested just skip over it. The following is not meant to be a comprehensive article either. So if you are looking for detailed specifics just Google it and there are a million sites explaining Hanukkah. The story itself has both religious and political motifs which are intertwined and certainly have a bearing on the history of the Jewish people of the time. The Greek king, Antiochus IV, had ordered the Hellenization of the Jewish people. This meant that the official policy was to make all Jews convert and accept the Greek ways and religion. The practice of Judaism was in effect made illegal. Certain laws were concentrated upon. Circumcision was outlawed; the laws of Kosher; and the laws pertaining to keeping the Sabbath. Antiochus saw these, and rightfully so, as being the central core of the Jewish religion, and he assumed if he could break these laws and traditions he would in effect break the back of the Jewish people. Mattathias, a Jewish priest, and his five sons Jochanan, Simeon, Eleazar, Jonathan, and Judah led a rebellion against Antiochus. Judah became known as Yehuda HaMakabi ("Judah the Hammer"). By 166 BCE Mattathias had died, and Judah took his place as leader. By 165 BCE the Jewish revolt against the Seleucid monarchy was successful. The Temple was liberated and rededicated. 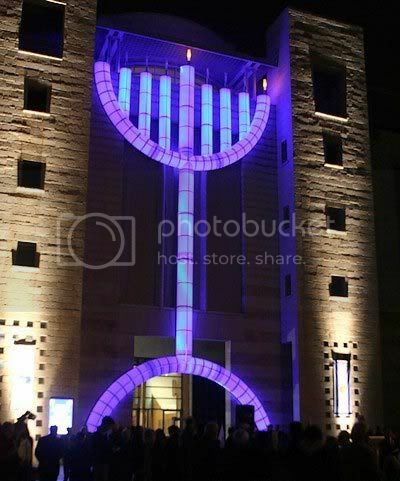 The festival of Hanukkah was instituted by Judah Maccabee and his brothers to celebrate this event. After recovering Jerusalem and the Temple, Judah ordered the Temple to be cleansed, a new altar to be built in place of the polluted one and new holy vessels to be made. According to the Talmud, olive oil was needed for the menorah in the Temple, which was required to burn throughout the night every night. But there was only enough oil to burn for one day, yet miraculously, it burned for eight days, the time needed to prepare a fresh supply of oil for the menorah. An eight day festival was declared by the Jewish sages to commemorate this miracle. 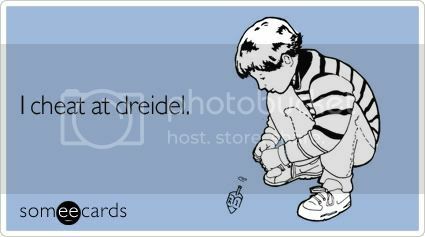 This then explains the very basics behind the story of Hanukkah. It must be made clear that there are a myriad of miracles including the one with the "oil" that are celebrated on Hanukkah. One of those miracles is the fact that a small army was able to defeat the Greek Empire. 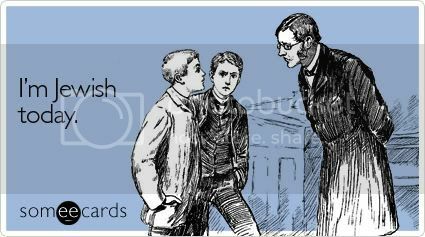 This also added to the myth and power of the holiday of Hanukkah. The most famous, and tragic story of the days leading to the revolt is told of Hannah and her seven sons. Though this story is told in many different versions it finds its roots in the Talmud and then in the Second book of the Maccabees (part of the Apocrypha). In synopsis, Hannah and her seven sons are imprisined and then each son is asked to bow before an idol and declare that the idol of Zeus is their God. As each son refuses he is killed. Below I quote this story, in old English, however the tragic essence is there for all to see. During the terrible times which followed the fall of the Holy City, Hannah and her seven sons were cast into prison. According to their ages they were brought before the tyrant conqueror, and commanded to pay homage to him and his gods. "God forbid," exclaimed the eldest lad, "that I should bow to thy image. Our commandments say to us, 'I am the Lord thy God;' to no other will I bow." He was immediately led out to execution, and the same demand made of his brother, the second son. "My brother bowed not," he answered, "and no more will I." "Wherefore not?" asked the tyrant. "Because," replied the lad, "the second commandment of the Decalogue tells us, 'Thou shalt have no other God but me.'" His death followed immediately his brave words. "My religion teaches me, 'Thou shalt worship no other God'" (Ex. 34: 14), said the third son, "and I welcome the fate accorded to my brothers rather than bow to thee or thy images." The same homage was demanded of the fourth son, but brave and faithful as his brethren, he replied, "'He that sacrificeth unto any God save unto the Lord only'" (Ex. 22: 19), and was slain pitilessly. "'Hear, O Israel! the Lord our God, the Lord is One,'" exclaimed the fifth lad, yielding up his young life with the watchword of Israel's hosts. "Why art thou so obstinate?" was asked of the sixth brother, when he, too, was brought before the tyrant and scorned the propositions made him. "'The Lord thy God is in the midst of thee, a mighty and terrible God'" (Deut. 7: 21), he said; and died for the principles he proclaimed. "My son, come bow before my gods." "God forbid! Our holy religion teaches us 'Know therefore this day, and reflect in thy heart that the Lord he is God, in the heavens above and on the earth beneath there is none else' (Deut. 4: 39). Never will we exchange our God for any other, neither will He exchange us for any other nation, for as it is written, 'Thou hast this day acknowledged the Lord' (Deut. 26: 17), so is it also written, 'And the Lord hath acknowledged thee this day, that thou art unto him a peculiar people!'" Still the tyrant spoke smoothly, and with kind words. "Thou art young," he said; "thou hast seen but little of the pleasures and joys of life, not as much as has fallen to the portion of thy brethren. Do as I wish thee and thy future shall be bright and happy." "The Lord will reign for ever and ever," said the lad; "thy nation and thy kingdom will be destroyed; thou art here to-day, to-morrow in the grave; to day elevated, to-morrow lowly; but the most Holy One endures for ever." "See," continued the other, "thy brothers lie slain before thee; their fate will be thine if thou refusest to do as I desire. See, I will cast my ring to the ground, stoop thou and pick it up; that I will consider allegiance to my gods." "Thinkest thou that I fear thy threats?" returned the unterrified lad; "why should I fear a human being more than the great God, the King of kings?" "Where and what is thy God?" asked the oppressor. "Is there a God in the world?" "Can there be a world without a Creator?" replied the youth. "Of thy gods ‘tis said, 'mouths they have, but speak not.' Of our God the Psalmist says, 'By the word of the Lord were the heavens made.' Thy gods have 'eyes but see not,' but 'the eyes of the Lord run to and fro in the whole earth!' Thy gods have 'ears but hear not,' but of our God ‘tis written, The Lord hearkened and heard.' Of thy gods ‘tis said, 'a nose they have but smell not,' while our God 'smelled the sweet savour.' 'Hands have thy gods but they touch not,' while our God says, 'My hand hath also founded the earth.' Of thy gods ‘tis written, 'feet they have but walk not,' while Zachariah tells us of our God, 'His feet will stand that day upon the mount of Olives.'" "If thy God hath all these attributes, why does He not deliver thee from my power?" "He delivered Chananyah and his companions from the power of Nebuchadnezzar, but they were righteous men, and Nebuchadnezzar was a king deserving of seeing a miracle performed, but for me, alas, I am not worthy of redemption, neither art thou worthy of a demonstration of God's power." "Let the lad be slain as were his brothers," commanded the tyrant. "Give me my child," she cried, "oh, cruel king, let me fold him in my arms ere thou destroyest his innocent young life." She threw her arms around the lad, clasping him tightly to her bosom, and pressing her lips to his. "Take my life," she cried; "kill me first before my child." "Nay," he answered, scoffingly, "I cannot do it, for thy own laws forbid; 'Whether it be ox or sheep ye shall not kill it and its young in one day'" (Lev. 28). "Oh, woe to thee," replied the mother, "thou who art so particular to regard the laws." Then pressing her boy to her heart, "Go, my dear one," she said, "say to Abraham that my sacrifice hath exceeded his. He built one altar whereon to sacrifice Isaac; thy mother hath built seven altars and sacrificed seven Isaacs in one day. He was but tempted; thy mother hath performed." After the execution of her last son, Hannah became insane, and threw herself from her house-top. Where she fell, she expired. Happy are ye, ye seven sons of Hannah; your portion in the future world was waiting for you. In faithfulness ye served your God, and with her children shall your mother rejoice for ever in the eternal world. The pathos behind Hanukkah, the miracle of the oil, the defeat of the Greeks, the inability for the Greeks to destroy the Jewish faith, the great sacrifices that were made - are all captured within this holiday. 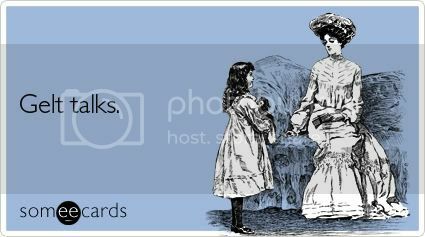 Yet there is one more even greater lesson from Hanukkah. One that not only the Jewish people have adopted, but one that is ingrained in the Judeo-Christian tradition and roots. This theme simply put, is about "bringing light where there is darkness" - to "chase away the darkness of evil". To revel and rejoice in the light. Our Rabbis taught: When the first Adam saw the day getting gradually shorter, he said, "Woe is me, perhaps because I have sinned, the world around me is being darkened and returning to its state of chaos and confusion. This then is the kind of death to which I have been sentenced from Heaven!" So he began keeping an eight days" fast. But as he observed the winter equinox and noted the day getting increasingly longer, he said, "This is the world's course", and he set forth to keep an eight days festivity. In the following year he appointed both as festivals. Now the Romans too had a festival of light during this time, and of course later Christianity in the form of Christmas and the birth of Jesus (the stars over Bethlehem and the light it brought to the world) as well adopted this motif. Indeed, one can say that Hanukkah is equally a celebration of the renewal and cycle of Nature as it is a commemoration of the miracle of light. It is a holiday where we rejoice in many ways over the creation of a new light. One through the miracle of oil, and the other through the miracle of nature. Since the Jewish "day" begins at nightfall, and goes from nightfall to nightfall, the Hanukkiah is lit at nightfall (or right before). 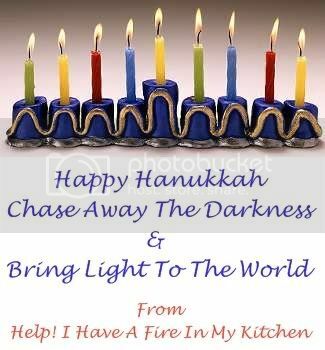 Though one can light the Hanukkiah during all the hours of the night, as long as there are those who will see it. The candles or oil should be enough to last for at least 30-45 minutes. The reason for the Hanukkah lights is not for the "lighting of the house within", but rather for the "illumination of the house without," so that passers-by should see it and be reminded of the holiday's miracle. Accordingly lamps are set up at a prominent window or near the door leading to the street. 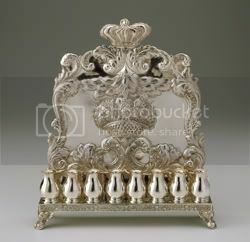 It is customary amongst some Ashkenazim to have a separate menorah for each family member (customs vary), whereas most Sephardim light one for the whole household. Only when there was danger of anti-semitic persecution were lamps supposed to be hidden from public view, as was the case in Persia under the rule of the Zoroastrians, or in parts of Europe before and during World War II. However, most Hasidic groups, light lamps near an inside doorway, not necessarily in public view. According to this tradition, the lamps are placed on the opposite side from the mezuzah, so that when one passes through the door he is surrounded by the holiness of mitzvoth. The "dreidel" or "sivivon" (in Hebrew - meaning a "spinning top") is in itself an interesting game and tradition. 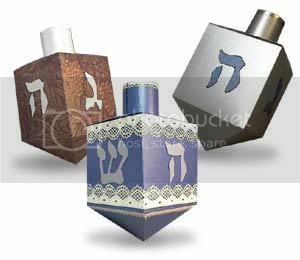 The dreidel has four sides and on each side appears a Hebrew letter. "Nun" which is the first letter in "Nes" - meaning "miracle"
"Gimel" which is the first letter in "Gadol" - meaning "big"
"Hey" which is the first letter in "Hayah" - meaning "was"
In Israel the forth letter is "Pay" the first letter in "Poh" - meaning "here"; outside of Israel the forth letter is "Shin" the first letter in the word "shom" - meaning there. The letters stand for the saying, "Nes Gadol Hayah Poh" - "A great miracle took place here"; Or (outside of Israel) "Nes Gadol Hayah Shom" - "A great miracle took place there". 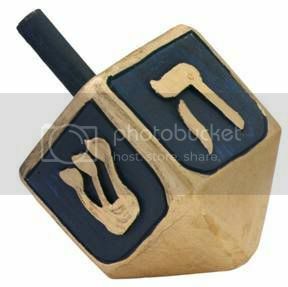 There are many legends and stories as to how the how the Hanukkah dreidel came to be invented. One, though maybe not totally true, serves to accentuate the story of the Maccabees and the revolt against the Greeks. Antiochus, among other things, forbade the study of Torah or the gathering of Jews in their synagogues. But the Jews kept on meeting secretly in small groups and in hidden places and studied the Torah by heart. In that way, if one forgot a passage, another who remembered could teach it to him while a third person served as a lookout at the door. When soldiers approached, a warning was given and the group would quickly break up and disappear through back doors and secret passages. One of the tricks that were used to avoid discovery was the dreidel game. The students always kept a toy spinning top on the table while they were studying. If a soldier appeared before the members of the group could run away, one of them would begin to spin the dreidel and all would pretend, enthusiastically, that they were engaging in an innocent game. The soldier had no way of proving otherwise. And so, a little Hanukkah dreidel came to be. Today, usually a game is played to guess on which letter the dreidel will land after spinning it and it is played for money. Hanukkah money or as it is known from the Yiddish, "Chanukkah Gelt" is given to the children. I have no doubt that the presents given on Hanukkah developed as a result of the presents given on Christmas. This was to make sure that Jewish children did not look with envy upon others who received presents during this time of year and they did not. Which of course, now turns the tables and everyone wants to be Jewish! 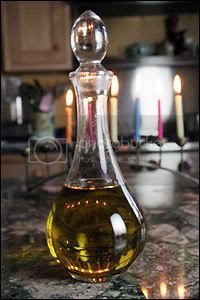 Now that you understand the reasons behind lighting the candles, and the miracle of the "oil" you will understand why the food associated with Hanukkah is basically "fried" in oil. There is a pretty good posting on this subject, "Beyond Latkes: Eight Nights of Fried Delights" by Bonnie Wolf. The usual fair that is mentioned are Latkes - Fried Potato Pancakes, and Sufganiyot - Donuts. 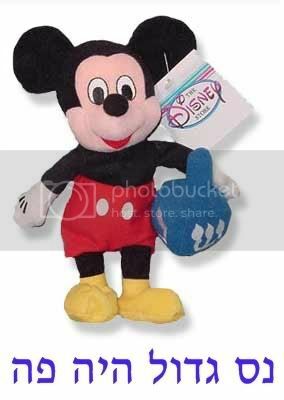 (See Help! I Have A Fire In My Kitchen and the post - "Sufganiyot - Donuts with Jelly & Other Fillings" for a great recipe! )It used to be that the Sufganiyot were just filled with Jelly. Now we have all different types of fillings, from jelly, to cream, to vanilla, to white chocolate. The donuts themselves are made a zillion different ways and the best tasting ones are not fried but baked (but who is complaining? not me!). My sister happens to make incredible Latkes. This picture is from our Hanukkah Party last week. But all in all, fried food in oil, even good ole' French Fries are fair edibles for Hanukkah. As you can imagine this is cholesterol heaven and not very healthy. But if you are careful and don't overdo it, then hell .. indulge yourself once in a while. Just to make this a recipe here, and to make you realize just how easy Latkes are... here we go. Put your hand in water (so the batter does not stick to it) and pat out a "latke" the size of your palm. Turn over the "latke" after three minutes or so. Continue the process with the rest of your "latke" batter. Simple and easy. No great need for any real difficult cooking or baking. A special treat for readers of Help! 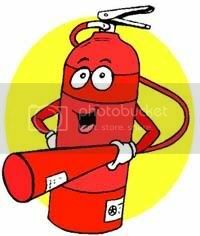 I Have A Fire In My Kitchen. Adam Sandler Three Part Video on The Hanukkah Song is really a treasure. DO NOT MISS THIS! Put On Your Yarmulke & Have A Happy Happy Hanukkah! 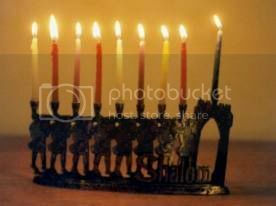 In conclusion it would be good for all of us to remember, Jew and non-Jew alike, the central theme of Hanukkah. Let us always remember to chase away the darkness and always bring more light into this world of ours. Let us rejoice in the light of the candles and set them as a sign for all to see - for in truth, a great miracle takes place every day in our celebration of life. What a beautiful and informative post. One of the benefits of living in a culturally diverse city, our children (like their parents) are blessed to learn many ways of many people. Today was my father’s birthday. I sat with two of my young nephews after dinner. They asked for paper and crayons to draw. I saw their attempt at a menorah, overheard them describe Hanukkah and what they have discussed in school. Ted, I laughed a bit when you mention the tradition of a gift a night during Hanukkah, believing it started so that Jewish children would not envy those who celebrate Christmas. My two little boys sat and talked about how lucky Jewish children are. happy belated Hanukka Teddy and all my Jewish friends. 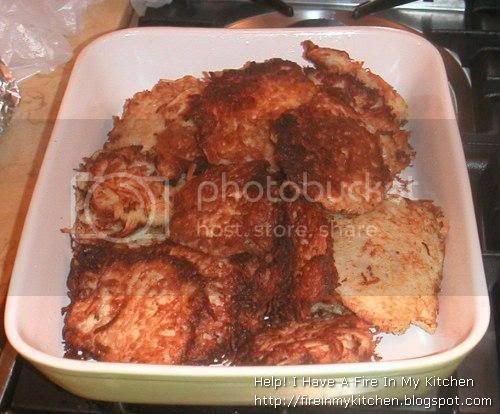 I have made latkes before and will make them again. I also want to get hold of a menorah. What a great message and one for all of us to live everyday, not just during the holiday season! A very Happy Hanukkah to you and you family, Teddy! What a great message and one for all of us to live everyday, not just during the holiday season! A very Happy Hanukkah to you and your family, Teddy!One of the benefits of living in a culturally diverse city, our children are blessed to learn many ways of many people.